You may have considered renting a lake house for summer vacation, but some lakes offer more than fair-weather getaways. If you are looking for a location that can become a family tradition any and every time of year, Tomahawk Lake, Wisconsin has family fun for any date on your calendar. Whether you are planning for Spring Break or Christmas, a Tomahawk Lake lake house will have everything you need to make your trip memorable. Tomahawk Lake is an unincorporated area in Oneida County. The town takes its name from the lake. But while the town is small, the lake is not. With 3,392 acres of surface area, there is plenty of space to spread out and enjoy the spectacularly clear water. Public boat landings and a public beach make accessing the lake a breeze. Tomahawk Lake is uncommon in that there are things to do on and off the water all year round. In addition to the lake itself and the bordering town, there are two nature parks in the area that offer a lot to see and do in any season: Tomahawk Lake Hemlocks State Natural Area and Northern Highland American Legion (NAHL) State Forest. In the spring, the lake fills up with migrating waterfowl, and the fishing season begins. Largemouth bass, musky, northern pike, panfish, and walleye are all common catches here, and the clarity of the water makes fish easy to spot. When you rent a Tomahawk Lake lake house, you’ll have the perfect home base from which to fish—plenty of extra room to store your gear and a full-service kitchen in which to prep and cook your catch. Tomahawk Lake Hemlocks covers 244 acres, and the NHAL State Forest covers a large 232,000 acres. Both parks are great places to hike, bike, picnic, and nature watch, and the NHAL State Forest also has opportunities for kayaking and canoeing. Summer is the busiest season at Lake Tomahawk. Warmer temperatures draw swimmers to join fishermen and birdwatchers at the lake, but the northern locale means that the temperatures stay mild, with the hottest days reaching about 77 degrees Fahrenheit in July. This creates the perfect conditions for outdoor fun and games. The town has a nearly 50-year tradition of hosting snowshoe baseball games every Monday evening of the summer. You can cheer on the home team or maybe even participate yourself. Local community organizations prepare delicious fare like burgers and homemade pie, and proceeds support the development of the community park and events like the Lake Tomahawk 4th of July fireworks display. You may even win a prize from a local business as you enjoy this local pastime. Bow and gun hunters flock to the lake in the fall for whitetail and grouse hunting. The nearby NHAL State Forest also allows hunting. 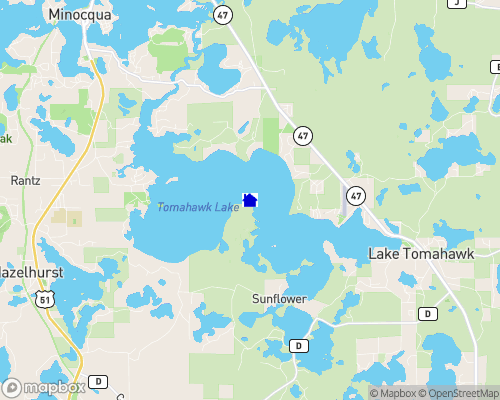 The Lake Tomahawk Meat Market is the place to go to have your game processed, and it is located conveniently near your lake house rental. The waters of Lake Tomahawk may get a little nippy for swimming as the season progresses, but boating is still a popular occupation in the autumn. And you won’t find a prettier time to hike along the NHAL and Hemlocks trails, with the mix of evergreen and deciduous trees of the Northwoods creating breathtaking fall color palettes. Wisconsin is one of the snowiest states in the country, so if you want to have fun playing in the snow, a wintertime Lake Tomahawk lake house gets you access to some of the best snowshoeing, cross country skiing, sledding, snowmobiling, snowball fighting, ice fishing, and everything else Winter Wonderland. Some of the NHAL State Forest trail systems are groomed for cross-country skiing for enthusiasts of varied skill levels, and other trails are reserved for snowshoeing and snowmobiling. The Lake Tomahawk Sno-Fleas is a group of snowmobilers that welcome visitors to ride along with them as they explore the frosted Northwoods. No matter when you decide to rent a Tomahawk Lake lake house, you’ll want to bring your camera along to capture unforgettable memories and stunning scenery. And once you’ve tried one season at Lake Tomahawk, you’ll want to come back again and again to discover what the other seasons have in store.